Our philosophy is fresh, local and seasonal. Chef Adair sources directly from local organic farms whenever possible and supports the growth of our culinary offering year over year. Our share plates and menu are a reflection of local ingredients and time spent with friends. Our team has paid particular attention to the wine list with something to suit every palate and pocket. Watermark’s wine list is a representation of the area’s finest wine producers including an attractive selection of both wines by the glass and by the bottle. Our feature wines will change based on availability from many of our unique limited production wineries. We feature a wide range of local beverages including wine, cider, beer, spirits and cocktails, locally and regionally created and inspired. Each item is designed to be enjoyed with the Wine pairing below, wine pours are 2 ounce, try one or try them all! Excellent food, nice music and great server. We enjoyed ourselves! Hello PamelaL. Thank you for your lovely feedback, we're glad to hear you enjoyed yourselves! We can't wait to welcome you back. Kind regards Tyssan Hough Food & Beverage Manager Watermark Beach Resort. Outstanding, atmosphere was great and the food was delicious. Hello Seanp, So great to hear you enjoyed your experience with us, thank you for your wonderful feedback. We hope to see you return soon! Kind regards Tyssan Hough Food & Beverage Manager Watermark Beach Resort. Service was extremely poor, Food was burnt and cold, Coffee was old. All and all a terrible experience and we will not go back. We returned our food. Pay our bill and left. The place is substandard at best. Owner needs to wake up and over see this business if they expect it to succeed. Because you employees are taking it down. We were given a "moonlight" package as a gift from our children to celebrate our 35th anniversary. Our server didn't know her beer selection and we were not impressed by her summary that all beers on the menu are BC beer. We ordered one from Toronto. The meal was very nice. The presentation also very nice. As part of our package, we had a coupon voucher for $50.00 towards the meal. The server was not supposed to put this voucher through the front desk we learned as after about a 20 minute check out, we were charged for 3 restaurant charges. The first was correct at $14.65. There was a restaurant charge of $77.00 appox. on our room check out which was not ours. The third charge was the meal we did enjoy totalling $48.85. We were charged for this at check out, but the voucher should have covered this. I had to question these charges for these to be reversed. As a gift from our children, we didn't want them to be billed the $141.00 approx that we were additionally charged. Great food, service, and ambiance! Very creative and well executed menu items. Delicious food and great service. Hell Wrichmo, I'm so happy to hear you had a great experience! We hope to see you back soon! Regards Tyssan Hough Food & beverage manager. The location and the restaurant were very good. Just a little disappointed there was no vegetarian dishes available for dinner however the food we did have was very good, staff was great and the view was perfect. The waitress was really nice. Wonderful meal prepared exclusively by the chef out on the BBQ. View and ambience were very nice. Waitstaff was friendly and timely with meal service. 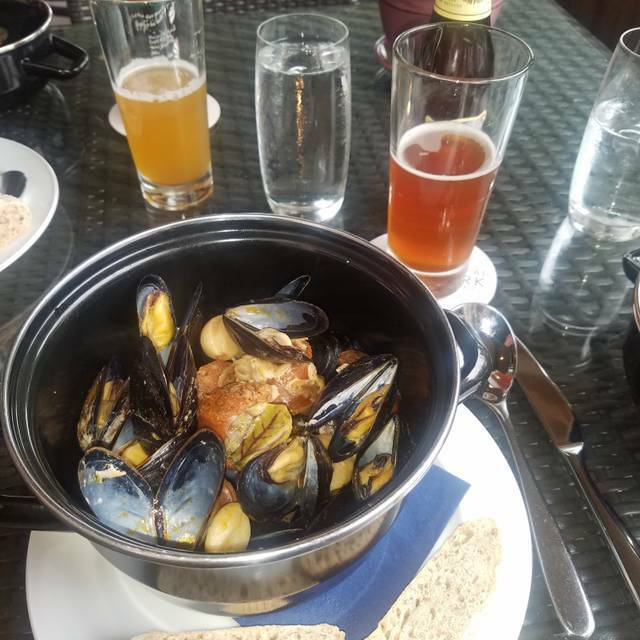 Enjoyed happy hour beer and mussels the next day! Would come again. I made a reservation but we showed up early to have a drink in the bar. We were escorted to a table and asked the name on the reservation. Half way through dinner I got a call from the restaurant wondering why we didn’t show - but we were seated there! One person in our group of 5 ordered from the bbq and was served 15 minutes before the rest. Awkward! The waitress thought this was logical but we should have been informed beforehand. The chicken thigh dish was simply awful. Amazing summer meals cooked on the BBQ, ribs are incredible! The meal was a delight - the pacing was outstanding! 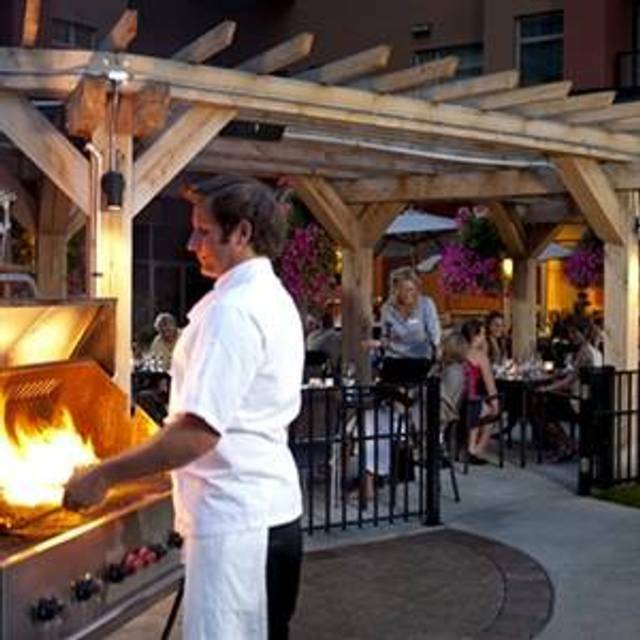 A great place for dining in Osoyoos. Nice evening out with very good food! Would definitely recommend Watermark. Great food. Waiter was friendly and knowledgeable. We came here in the busy season and it was most enjoyable but now that it's the slow season, service was excellent, our waiter recommended several dishes that we enjoyed. Amy was an OUTSTANDING server! Being so young, I was incredibly impressed by her professionalism and dynamic communication skills. The food was beyond excellent. It was my birthday dinner with my boyfriend so we were looking for a nice romantic evening out and I can honestly say the Restaurant at the Watermark did a fabulous job in making me feel special on my birthday (even though you guys had no idea). The sausage/beans dish was exceptional and the chef slipped us a little extra soup which made me feel super happy! LOVED this restaurant and experience and I will be recommending it. Great tasting menu like salmon tacos and patates brava. Good selection of local wine and beer. Fantastic! Ordered way too much food though. They recommend one of the smaller plates + a larger plate and that was too much food for us. We always eat here on our first night in Osoyoos, and this year we went back for the final night, too. Since it is in the Watermark resort, you would almost expect more of a "utility" menu with a focus on burgers and fries, etc. But instead it is a place for simply prepared tasty "locavore" oriented items, e.g. tomatoes from nearby Covert Farms. My husband raved about the Patatas Bravas. We both loved the fresh tomato salad with house made ricotta. I thoroughly enjoyed the fish tacos with Okanagan River sockeye served with tasty house-made condiments. On the first night, when asked, I admitted I didn't like the Caesar salad with stone fruit - it was served with the lettuce practically whole, leaving the guest to cut it up and toss it. I found it too acidic and logistically difficult to eat. We were served complimentary desserts in response. Very classy gesture, which contributed to our decision to return for another meal. Lovely to sit outdoors next to the lake. Bonus: local wine tasting tips from our lovely server. Food was bland and service was very poor. Our order was clearly not put in yet the waitress never admitted it and never apologized for the delay. The staff were pretty useless but the manager totally understood and comped a bottle of wine and the tapas that were so late. I've been there twice before and enjoyed it but this time was a bit of a disaster. Worst meal on our four day golf trip and we won't be back for sure. The bbq ribs entree were very good. The bread choice wasn't worth ordering. The warmed olives were plentiful. The chicken thighs entree were moist and tender. Good wine selection. The bbq veggies choice also good. Served family style but shared with just us two. Waiters were very informed. Good place, food, cocktails and service. Amazing people! good food. would eat there again. cozy inside, nice outdoor area but no patio heaters for cool nights. Recently, celebrated a birthday at the Watermark and enjoyed every single minute. The food was superb and our server, Dylan, went above and beyond ourexpectations. His professionalism and wonderful conversation were 5 STARS!! The food was absolutely disappointing. All the meals were brought out at different times. Very pedestrian food. Nothing special at all. Very oily chicken thighs in flavourless mashed polenta. Undercooked, rubbery rack of ribs you couldn't even cut with a steak knife. The BBQ sauce tasted like it was straight out of a bottle. A "spicy" shrimp skewer on couscous that seemed to be maid with the house mayonnaise. That was cold. And a caesar salad that looked liked one head of lettuce cut in half with a few croutons on it. We asked if the fruit cobbler was warm, it wasn't at all. I would not recommend this restaurant and would never return. My elderly parents and I enjoyed our dinner at the Watermark. We were impressed with the food and the service. The manager served us and other tables that evening. I found him courteous and welcoming despite the heat and the multiple demands of the patrons who were there for dinner that night. My parents are finicky eaters so when they said they enjoyed the entire meal consisting of multiple tapas plates of various foods rather than individual entrees it was a relief as I was aiming to please given how long we drove to get to Watermark restaurant. Thanks for the good experience, we will return the next time we visit Osoyoos! Good waterfront dinning location. Food's good but a bit pricy. Visiting Osoyoos for the first time. Lovely location and ambiance. We were told it was family style sharing, but decided to order our own meal. The waitress said she couldn't garauntee the food would arrive together this way, which surprised us, but in the end it did. Very small portions but pretty tasty. Such a beautiful restaurant! Loved it! The ambience was excellent and the food was deelish! The chocolate ganache dessert was awesome! They have a lovely patio but unfortunately there was a wedding reception right next to the dining area which was slightly annoying. But the manager Tom took care of us and we had an amazing meal with paired wines. Thank you Tom for saving our night! This was a beautifully located restaurant. The service was awesome and the food was ok. They have a kids menu which was nice. Very poor service at a "share the items concept". Yawn. Some might like this but not worth the effort as the menu fare is limited. The service was extremely poor as was the venue. Made arrangements to move inside if it rained and was then told, "oh well, we're full", when it started to downpour. What a joke. Wouldn't recommend this dump to my worst enemy. What an underwhelming experience. Steak was great, the char was inedible. Pass on this one!